As one of the largest credit card issuers in the world, Chase Bank has plenty of experience in meeting the needs of consumers. Chase knows there are different cards for different spending needs, which is why they offer a range of credit cards with a variety of features and rewards. From frequent flyer programs to cash back bonuses to attractive balance transfer offers, Chase has a credit card to meet just about any consumer or business need. Let’s take a close look at their most popular card offerings; Chase Freedom®, Chase Freedom Unlimited®, and Chase Slate to see which credit card might be right for you. For consumers who love racking up the bonuses and rewards associated with some credit cards, the Chase Freedom® may be the right choice. With this generous credit card, users can earn 5% cash back on purchases in rotating bonus categories each quarter. You’ll also earn 1% unlimited cash back on all other purchases you make. The 5% bonus categories rotate each quarter and can vary from gas and transportation to grocery purchases to restaurants and entertainment categories. Any purchases made in these categories during the quarter earn an automatic 5% cash back. In addition, new cardholders can earn a sign-up bonus after spending a specified amount on purchases within the first three months of opening an account. The Chase Freedom Unlimited® takes a simpler approach to earning cash back rewards. The 1.5% cash back bonus reward on all purchases made with the Chase Freedom Unlimited® is one of the highest around. This is an excellent choice for people who use their credit card frequently throughout the month for a variety of purchases, and who may not have the time to take full advantage of the bonus categories that the Freedom card offers. And like the Chase Freedom®, the Chase Freedom Unlimited® comes with no annual fee, a sign-up bonus, and a 0% APR for the duration of the promotional period on purchases and balance transfers. 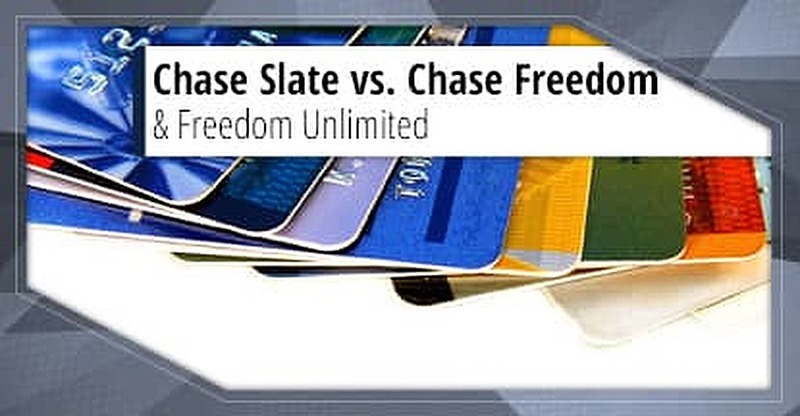 The Chase Slate® card is specifically designed for those consumers with high credit card balances. It offers no cash back bonuses, reward points or miles, but that’s actually a good thing. Chase understands that incentives can entice people to use their card more, rather than paying down their balance. Instead, the Chase Slate card offers something more valuable to cardholders — an introductory no-fee balance transfer option and an extended 0% balance transfer period. This industry-leading balance transfer combination is a powerful tool for people with a lot of credit card debt, and who want to pay it down in the most effective way. Which Popular Chase Card Belongs in Your Wallet? Since different spending habits require different types of credit cards, Chase has designed their credit card family to be as flexible as possible. Consumers who want to pay down debt as quickly as possible can do so using the Chase Slate® — the industry’s top balance transfer card. For those who like to maximize their bonus points and rewards, the Chase Freedom® card offers 5% cash back on bonus categories. And for folks who want to keep things simple, yet still get the most cash back on all of their purchases, the Chase Freedom Unlimited® simply can’t be beat. No matter your credit card purchase habits and needs, Chase has proven once again that they have the right card for you.